Radiance is more or less a prerequisite when you’re a celebrity. 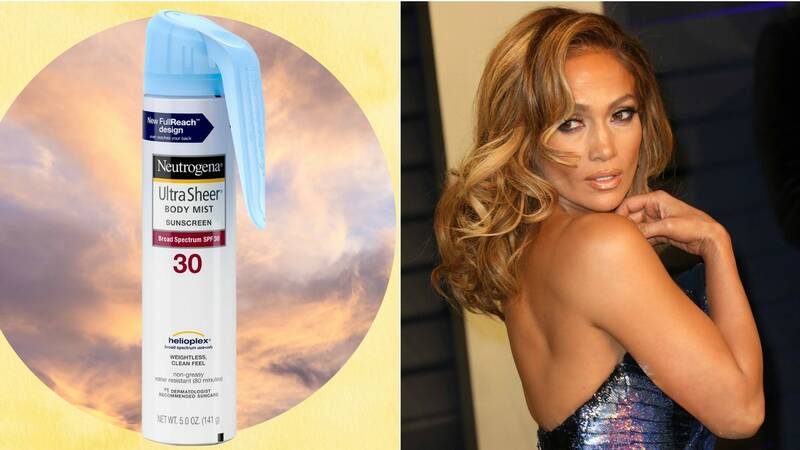 Whether they’re onscreen or on the red carpet, we expect our stars to shine (in a non-greasy way, of course) — and no one is known for a nonstop glow quite like Jennifer Lopez. The iconic entertainer’s sun-kissed skin beams from head to toe — an attribute that can be chalked up to three things: great genes, a serious skin-care routine, and of course, the magic touch of her go-to makeup artist, Scott Barnes. Earlier this week, Barnes joined YouTube star Tati Westbrook for a video in which he gave her a glamorous, bronzed look inspired by J. Lo’s signature beauty style. And as if it weren’t awesome enough to get her makeup done by the artist Gwen Stefani and Celine Dion trust with their faces, Us reports that Westbrook actually got Barnes to reveal one of his most amazing radiance-boosting hacks. After Barnes covers all of Westbrook’s exposed skin with bronzer, she asks him a question from one her Twitter followers: What’s your favorite drugstore product? As he sips on Pellegrino, Barnes somewhat reluctantly says, “My favorite drugstore product is Neutrogena,” followed by, “I use this Neutrogena spray.” Westbrook looks understandably confused as she wracks her brain trying to remember if Neutrogena makes spray-on makeup. After seemingly hesitating, Barnes reaches off-camera and pulls from his kit Neutrogena Ultra Sheer Body Mist Sunscreen SPF 30, only further confusing the YouTuber. When Westbrook asks Barnes why he likes it, he demonstrates by spraying her shoulders and chest with the mist, instantly illuminating her skin. “Look — super glow,” Barnes says as Westbrook recovers from the minor shock. “But it’s sunscreen!” she says, still baffled, yet completely enamored of her undeniable luster.